Dykwia has this hilarious story of a Focus journalist who went to New York to write a piece on the election and came back with a story ("New York bläst Trübsal" / "New York in a state of affliction") that was in parts stolen from the New York Times. "It appears that Jürgen Schönstein of German formerly-conservative magazine Focus is trying to pull a Jayson Blair in his story." Another proof that the "Bush Derangement Symptome" is constagious. „Am 11. September habe ich nicht geweint, aber jetzt ist mir wirklich zum Heulen", gesteht eine Passantin. So steht es im Focus-Artikel. Das nenne ich schon unglaublich, unglaublich dumm und unerträglich dumm. Wie kann man etwas derart Dummes verbreiten?! Nur wenn man diese Dummheit teilt. Reminds me of the time Malte Lehming of the Tagesspiegel plagiarized a N.Y. Times article about "metrosexuals". Man möchte erst gar nicht wissen, wo noch überall nach Herzenslust für den Focus "geklaut" wurde, wenn sich die hauseigenen Redaktuere als unfähig erweisen, der Qualifikation ihrer Journalistenarbeit gerecht zu werden. Today I read some German newspapers (online). Why did they all vote for Bush? They cannot believe it. What happened? Most of them believe, it is all about religion and morale. I have another idea: It is all about lies. People are tired of this kind of politics, this kind of media support. They have a deep desire for truth and truthful politicans and truthful reports. They discovered that Kerry was the liar and not Bush. Perhaps it is that simple. In der Tat kommt es einem so vor, als sei unisono der deutsche Medienchor: Amerika ist ein Land, wo religiöse Fundamentalisten durch die ganze Gesellschaft eine konservative Revolution vorbereiten, und genau das sei der Grund, weshalb George W. Bush derart eindeutig Kerry in die Schranken weisen konnte. 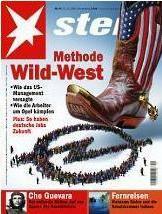 Damit werden einmal mehr jene Stereotypen bedient, mit der Europäer ihre vermeintliche säkulare Überlegenheit bekunden, während für Amerika noch die Aufklärung ansteht. Es ist eine stark simplizistische Sichtweise, wohl aber die, mit welcher dem Informationsdurst des deutschen Durchschnittskonsumenten am besten gedient ist. Kerry gibt auf - gut so! Hoffnungsträger des modernen weltoffenen Amerikas??? Gabi, you're right on the money. "Kerry lied, the Democrats cried." Tom Wolfe (The Right Stuff, Bonfire of the Vanities) gets it in this interview in the Guardian. "I think support for Bush is about not wanting to be led by East-coast pretensions. It is about not wanting to be led by people who are forever trying to force their twisted sense of morality onto us, which is a non-morality. That is constantly done, and there is real resentment." @Gabi: Hoffnungsträger des modernen weltoffenen Amerikas??? Bingo! 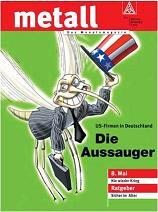 What gets me about the German media, is that they paint their own viewpoints on to Kerry and the Democrats. Do they actually listen to what Kerry said and did during the campaign? They couldn't have listen, then write the things they write. My favorite example, which has been all over the German media, not to mention George Soros and other American 'progressives', is the issue of "pre-emption". The German Media template, George Bush is a warmonger, who invented the doctrine of pre-emption is making war on the entire world. Ah, sportsfans, John Kerry said very clearly in the first debate that he too believed in the policy of 'pre-emption' and that no President would wait to be attacked in order to respond. Kerry's slogan on all his signs was "For a stronger America". Kerry repeating asserted that he would fight a 'smarter and better' war on terror. Why did Kerry have himself photographed carrying a shotgun, coming back from a goose hunt? Why did Kerry go to Mass every week during the campaign? Why did Kerry go into the Black churches all through the campaign? Why did Kerry talk about his Catholic faith and quote the Bible during the campaign? The idea that religion is all a bunch of unenlightened rednecks, who are lead around by the nose by the Republicans, is simply untrue. 95% of Americans believe in God. A politician has to take account of that fact. Kerry's campaign, Kerry's foreign policy, Kerry's domestic policy was totally and completely reactionary. What were his scare lies? He tried to scare young people with the threat of a military draft. Kerry can't leave the '60s. The modern American military does not need masses of people. It's high tech, it requires tons of training and needs people hanging around longer than 2 years. Kerry tried to scare old people, that Bush was going to privatize Social Security and stop their checks. Problem was, they said that 4 years ago and the checks are still being mailed. Point is Kerry promised that Social Security would not be changed. But Social Security has to be changed, it's doomed. Pure reactionary. Kerry's foreign policy was to return the to happy days of the '90s, when terrorism was just a nuisance. 9/11 did not change John Kerry, he said. Well, it changed the American People. This is not "weltoffen", this is reactionary politics at it's purist. Gabi nails it. It's just too bad, the German Media doesn't simply report what's being said and put some trust in the German People. Schade , was aus der Zeitschrift FOCUS geworden ist. verstanden - immer wieder habe ich mich ueber die Schlagzeilen und Beitraege geaergert. Heute lese ich sie einfach nicht mehr. Dann schon lieber den Original Spiegel - den lese ich allerdings auch nicht. Wie gesagt, ich muss es wohl dieser Ignoranz zu verdanken haben, dass ich als Bush Anhaenger die letzten Monaten so einigermassen ueberstanden habe.